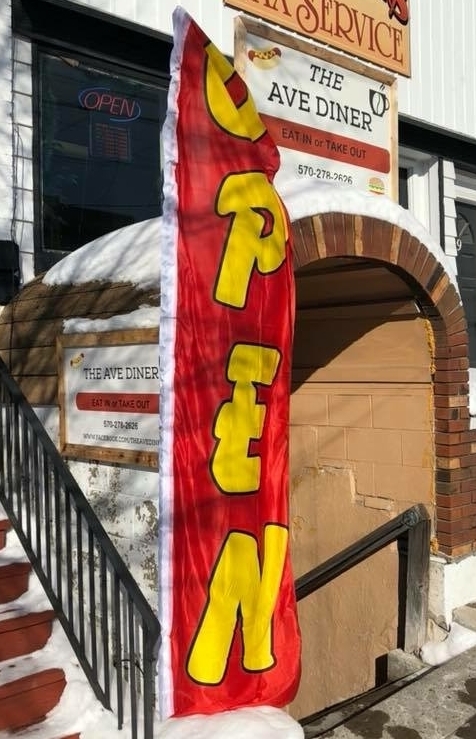 Brian Welch, owner of The Ave Diner on Public Avenue in Montrose, recently received word from the borough's zoning officer that this "open" flag, which he has displayed for about 1-1/2 years, is in violation of the town's zoning ordinance. Brian Welch, owner of The Ave Diner on Public Avenue in Montrose, recently received word from the borough’s zoning officer that this “open” flag, which he has displayed for about 1-1/2 years, is in violation of the town’s zoning ordinance. 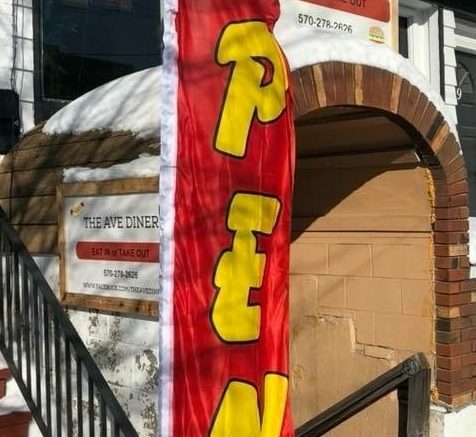 For nearly a year and a half, Brian Welch has used a vertical pennant to alert passersby that his basement level diner is open for business. It was in use until about two weeks ago, when Welch received a visit at The Ave Diner from the zoning officer telling him he was in violation of the town’s zoning ordinance, he told the Montrose Borough Council at Monday night’s meeting. The previous owners of the business also had the pennant – which Welch described as a “windless flag” – had also used it. With the diner’s below street-level location he said, “I need enough of a draw to make people come down the steps.” The banner, he explained, was only on display during his business hours, 6:30 a.m.-2 p.m. The zoning officer did not issue a notice of violation, instead Welch was given what the borough referred to at the meeting as a “friendly reminder” about the ordinance provisions. “Every other business has an open flag,” Welch said. Borough secretary Lillian Sienko said Welch’s flag falls under the category of “banner” in the zoning ordinance and that the size and material is not in compliance. Borough solicitor Michael Briechle told Welch that, if he receives a violation, he can appeal that to the zoning hearing board. Councilman Randy Shuster asked Welch if he would consider getting a different flag. Welch said that since receiving the notice he was in violation of the ordinance he has used a different “open” flag, but said it is less effective. In other business, the council set meeting dates for the coming year. Meetings will continue to be held on the first Monday of every month at 7 p.m.; and the third Monday of the month at 7 p.m., on an ‘as needed’ basis. In September, council will meet on the second Monday of the month. The borough also adopted the 2019 budget with about $1.26 million in anticipated expenses; and revenue expected at about $$998,000. Council did hold the line on taxes, so borough residents will not see an increase in their 2019 tax bills. Mayor Tom LaMont extended his thanks and compliments to the Christmas in Montrose organizers. Councilman Tom Follert said Seneca Lewis and Ruth TenHoeve spearheaded much of the event planning. Welch, who stayed through the meeting, reported that downtown shops were busy. “I had more business Saturday than on the Fourth of July,” he said. Councilwoman Judy Kelly applauded the efforts of all those who planned and facilitated the event. “A busy town – that’s a good thing,” LaMont said. Be the first to comment on "Montrose: ‘Open’ banner violates zoning"